Woman wanted after attempting shopping spree using stolen credit cards | Crime Stoppers of the Lowcountry: 554-1111 | 1-888-CRIME-SC | Anonymous tips earn cash rewards with Crime Stoppers of the Lowcountry. 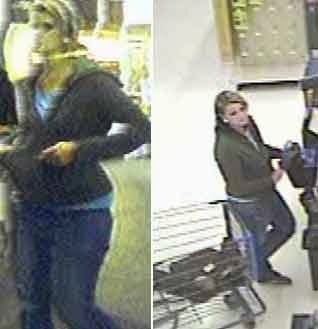 GOOSE CREEK, SC (WCSC) - Authorities are attempting to identify a woman who attempted to use stolen credit cards to go on a shopping spree at a Walmart. The Goose Creek Police Department released pictures of the woman and her vehicle on Monday in hopes that anyone with information will contact investigators. On Nov. 3 at 10:20 p.m., investigators say the suspect was seen entering the Walmart on 605 St. James Ave. in Goose Creek and using credit card that was stolen from a wallet at the Ladson fairgrounds. Police say the suspect attempted to purchase $1,047 worth of items using one of the credit cards. The suspect also made additional fraudulent charges in the area. If you have any information you are asked to call Inv. Micah Fogle at (843) 863-5200 ext. 2334 or Crime Stoppers at 554-1111.